There is an aspect about Burger King that I don't trust, and I can't put my finger as to why. Maybe, it's because I unfairly view Burger King as a follower and a copier of its big brother. I get the same feeling about my teenage daughter's boyfriend. Even though he has done nothing wrong, I just want to smack him. The burger on the Whopper with cheese was a flame broiled, thin, quarter-pound frozen patty. While it was dry, it had a flavor that resembled beef, but was covered up by a very strong liquid smoke seasoning. It was one of the few palatable fast-food burgers that could be eaten without the condiments and bun. The bun was a flat sesame seed, Wonder-type bun found at most quickie burger restaurants. This generic bread, however, was toasted and steamed. Underneath that top cover was chopped iceberg lettuce, pieces of white onion, two small slices of tomato, three pickle slices and half a jar of mayo and catsup. If were to title this review it would have to be "Burger Jester" (the joke is on the patrons), or "where there's smoke there's a Whopper patty". 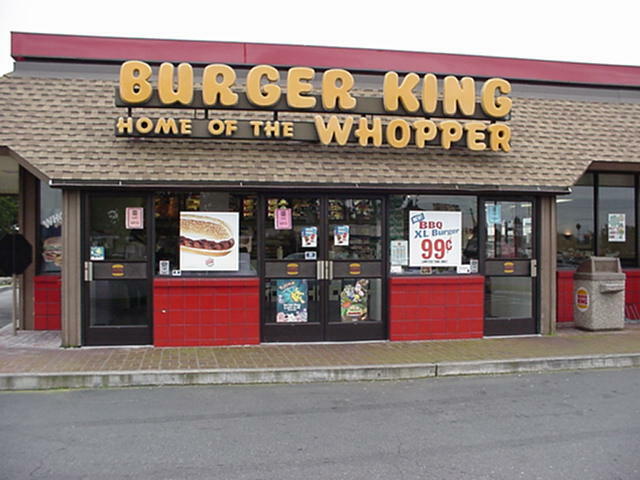 This Whopper with Cheese experience brought me back to my childhood old time fourth of July memories. The patty, although dry and crumbly, actually resembled beef. The problem, aside from the texture, was the smokey flavor. It filled my sinus cavity for a week! The bun was weak, the lettuce was chlorine soaked chop, and the whole was dripping in catsup. The fries were weird. Once again I closed my eyes in a supreme effort to focus and what I thought I was eating was Tator- Tots or those hash brown things at McDonalds. Then my childhood once again appeared as a vision, I saw myself as a mere tot of 13 years or so eating fries I found wedged in the back seat of our Mercury Parklane. As usual the memory is better than the reality.